DOLORES HAYDEN’s books on the American landscape include Building Suburbia and The Power of Place: Urban Landscapes as Public History. Her poems about places have appeared in many journals and anthologies including The Yale Review, Southwest Review, Raritan, and Best American Poetry 2009. 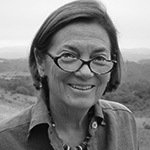 She has published two poetry collections, American Yard (2004) and Nymph, Dun, and Spinner (2010) and received poetry awards from the Poetry Society of America, the New England Poetry Club, the Virginia Center for Creative Arts, and the Djerassi Foundation. She teaches at Yale.